I was commissioned by Healthvision to build a large LEGO neighborhood that would represent their business model.... Healthvision's builds "Connected Healthcare Communities", so they thought that LEGO made a good metaphor. The model was installed at the HiMSS convention in Dallas, TX, February 13-17, 2005. Healthvision plans on using it at future trade shows, and has indicated they may also install it in their corporate office. - Over 30,000 pieces (actually closer to 33,500). - It took about 350 hours to design, build and glue. - Each building can be lifted up for packing and transport, and the two larger buildings separate into sections, and the base (containing the machinery) splits into four large sections. For the model, I created buildings that represent the various parties that a patient encounters on a regular basis -- A highrise for the insurance company, a hospital, a local doctor's office, a medical lab, a pharmacy, and a patient's home. 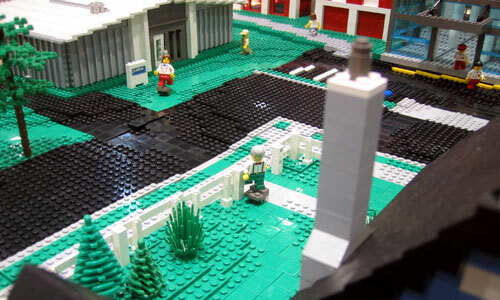 I "connected" the community by having LEGO mini-figures walk from location to location, while lights strung between the buildings represented the data transfer that Healthvision's product enables. The biggest challenge for me on this project was enabling the LEGO people to walk around. It took at least 30% of the total time of the project, and still could have used a bit more work. I hooked magnets up to underground motors that pulled the people along, but the friction encountered often proved too much and the people would tend to fall over or get stuck. All in all it worked pretty well at the event, but it was VERY hard to get it working. I wanted each building to be immediately recognized as the "community member" that it represented. This was easy for some of the buildings - like a single family home. Other buildings proved more challenging. For example, what does a doctor's office look like? Some doctors work out of rebuilt homes. Others are in strip-malls. Others are in big hospital looking buildings. It was a real challenge coming up with designs for some of these more ambiguous buildings, while still making sure that the buildings didn't look too similar to each other or to adjacent buildings. I think the end result worked well. The insurance company is a large international-style glass-and-steel high-rise, loosely modeled after 130 Liberty Street, a New York City office building partially destroyed by the terrorist attacks on September 11, 2001. I usually build model buildings hollow, but since the clear windows would allow you to see straight through the building, I added floors in between each story. This allows you to see straight through whichever floor you are eye-level with, but not up-diagonally or down-diagonally through the building. It has a very realistic effect as you walk towards the model and your viewing angle changes. But favorite feature of this model is the random pattern of open-and-closed window shades spattered across the windows. Adding them make the model looked even more realistic. This was the most straight-forward model in the project. I looked through house-floorplan web sites until I found a nice cute single-family home that I through would render well in LEGO. This model is almost a literal transcription of a home I found on coolplans.com. My favorite details are the front door, the TV antennae, and the mailbox. As I mentioned above, coming up with this design was pretty challenging. After tossing out a lot of ideas, I finally decided to build the doctor's office to look like it belongs in a relatively new medium-cost suburban professional park. For the hospital, I wanted to create a model of a real hospital, but I had a specific look in mind: a building that is rather tall, that has had a ton of additions tacked onto it over time, as the hospital grew. Furthermore, urban hospitals were too tall & narrow, and suburban hospitals were too sprawling. I didn't have enough space to create sprawl, and contractually, I'd agreed to create a hospital that was 3 feet tall. So, I decided to make up a hospital, and a made-up history to go with it. My imaginary hospital was built in the 1950s, originally a large, plain monolithic white tower, built on a budget. In the 1970s, an ugly brick-and-concrete addition was tacked onto the side of the building, with no attempt at matching the architectural style. Later,in the late 1990s, a glass and steel atrium was added to join the two sections and to expand the first floor (ER?) capacity. I flat-out had no idea what a medical lab looked like. I only ever went to get a blood test once, and it was in a downtown city-center location. After a lot of research and a lot of back-and-forth discussion with the client, we deduced that "labs" usually are tacked onto the side of a hospital, or built quickly, or even as afterthoughts. So for this model, I decided to make it look like it was made with corrugated steel, and that it belonged in an industrial park. This one was easy, since corporate-chain pharmacies are all over the U.S. I orignally wanted to build a Rite-Aid because I thought that they were more interesting looking buildings from a modelling point of view... but I don't think Rite-Aid is located anywhere other than the North Eastern US. My primary goal was for these buildings to "read" instantly as a particular type of place, so I opted to go with a nationwide chain. CVS buildings are too generic looking, and Eckards are just plain ugly, so Walgreens it was. I replicated a Walgreens and created a logo that says "Pharmacy" in Walgreens-esqe lettering. Here are a few photographs of me working on the model. I was on a VERY tight schedule -- I worked 7 days a week, 12 to 16 hours a day, for a month. Coffee was my friend.